Star Wars fans were shocked when it was announced that Carrie Fisher will be returning for Star Wars 9 without the use of CGI or another actress, and now Mark Hamill is commenting on his on-screen sister's return. Lucasfilm and J.J. Abrams revealed that Fisher will be back as Leia Organa in the final movie of the new trilogy thanks to unused footage from 2015's The Force Awakens. Lucasfilm and Disney vowed that they would not use CGI or bring in another actress to replace Fisher in one of most iconic roles of all time. This left many fans to wonder how they would address her absence in Star Wars 9. 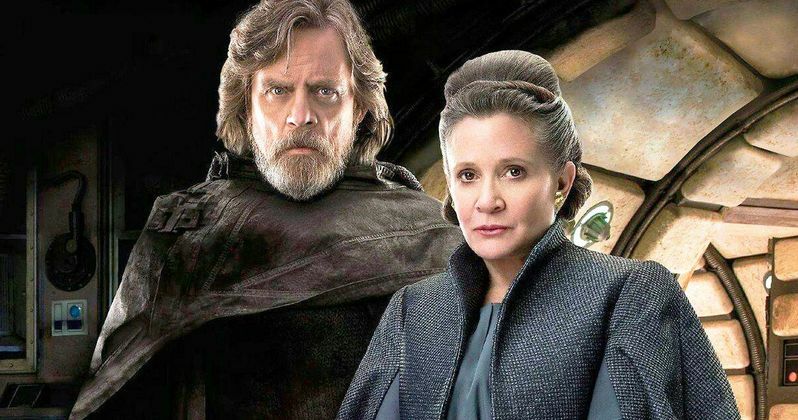 Mark Hamill posted on social media to declare how happy he is that Carrie Fisher will be back for Star Wars 9 with him. Obviously, it's bittersweet for Hamill, and the whole crew of the movie, but this seems like the best outcome for the film. Hamill is really happy that Fisher won't be replaced and calls the late actress "irreplaceable." He had this to say. "It's bittersweet facing my final chapter without her-She is simply irreplaceable. I'm finding solace in the fact that she won't BE replaced & would love the worldwide outpouring of affection from those who loved her when they heard the news." Star Wars 9 was originally going to center on Carrie Fisher's Leia Organa, much like The Force Awakens put the focus on Harrison Ford's Han Solo and The Last Jedi put the spotlight on Mark Hamill's Luke Skywalker. However, that all changed in December of 2016 when Fisher sadly passed away. While many believed that her performance in The Last Jedi was going to be the last, J.J. Abrams and Lucasfilm discovered that they had enough unused footage to bring her back. It's unclear how the unused footage from The Force Awakens will be utilized and how much of it will make it into Star Wars 9. With that being said, it sounds like a tricky task that will involve some serious digital heavy lifting in the post-production process. It's also unclear if the film will give Leia Organa a proper goodbye, or if they'll let the character live on through the last installment in the new trilogy. Star Wars 9 officially begins shooting in England next week and details are still pretty scarce as they will more than likely remain throughout the filming and post-production process. That just means that there's still a lot more to look forward to in the coming months, like the official title. At least the cast was announced, revealing that Mark Hamill, Carrie Fisher, and Billy Dee Williams will all be returning for Star Wars 9. You can read the social media post about Fisher's return for the final movie in the Skywalker saga below, thanks to Mark Hamill's Twitter account.